The one thing we needed to fix after our last inspection was the bathroom duct. We chose the wrong kind, which neither of us noticed because we have never done bathroom ducting before (I know all about kitchen ducting, which is a different deal and a real fire code concern). 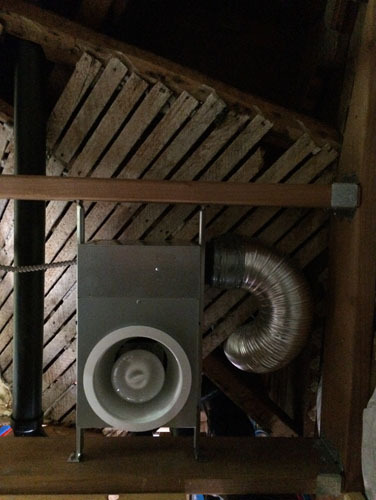 Anyway, we had to change the duct from the plastic insulated duct to metal flexible duct. Easy enough, right? 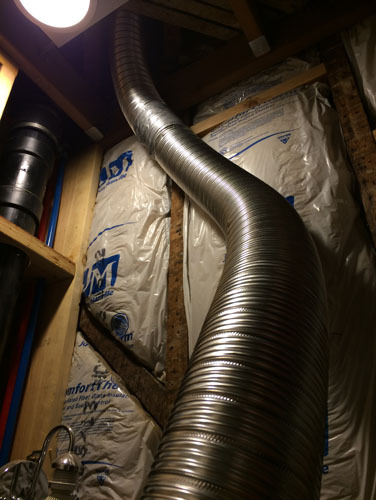 The flexible duct comes in little lengths of tubing that you pull on to fully expand. Then they get stuck together with these connectors and ring clamps, which you seal off with tape. Actual duct tape, not duck tape. Here is one of our attempts to fish one of these bad boys through the crooked and weird passageway from downstairs to the attic. We did this five, maybe six times? Maybe a hundred? I'm not sure, but time after time Noel would start pulling it up through the space behind the toilet and it would catch on YET ANOTHER STUPID NAIL which would shred the duct (since it's fairy light-grade metal). Then Noel would cut off that nail, look for others, and take off the damaged portion of duct and join on a new piece. The sweet spot seemed to be after multiple times cutting off nail ends plus lining the hole with a sliced up cardboard box. 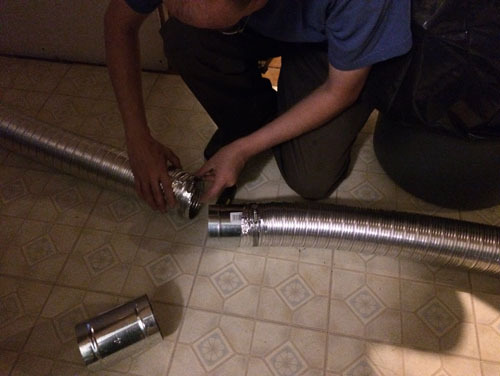 We had exactly enough duct to do this. The poor guy actually took several days off work to work on the house last week and this was all he managed to get done, though perhaps I should also include NOT MURDERIZING ANYBODY out of frustration as an accomplishment. But now it is done and we can power through some drywall.